Eight years ago Al Lucas was killed from an on-field hit during an arena football game. How would a similar tragedy today affect the NFL? Roger Goodell and I have the same nightmare. In it, an NFL player is killed during a game. Unlike the Commish, who was revealed to have this fear (the NFL and Goodell both disputed the assertion) in a recent profile in ESPN The Magazine, there is nothing figurative about my bad dream. It attacks my sleep periodically, usually in the summer rather than during football season, as if my subconscious is reminding me just how much the NFL means to me. The doomed player in my nightmare isn’t one of my beloved Cincinnati Bengals. He wears a generic dark jersey that could be any team’s uniform. He is catching a pass, so he’s probably a wide receiver, though because I can never make out his number I suppose he could be a tight end or a running back. He jumps for a high throw, and as he comes down he is blasted on either side. One defender hits him high, one defender hits him low. And then he’s literally ripped in half by the force of the hits. Right after this point, I always wake with a start, bile rising in my esophagus. I relate this gruesome glimpse into my subconscious because I know precisely when the dreams began. It was eight years ago, when a professional player — a former NFL defensive lineman — suffered a fatal spine injury on the field. His name was Al Lucas and he played defensive tackle for the Arena Football League’s Los Angeles Avengers. He died on the hard carpet of the Staples Center eight years ago this week, on April 10, 2005. He was 26 years old. No, he wasn’t torn asunder by opponents. Instead, a relatively unremarkable collision took his life. Nothing about it was unique to arena football and its roller derby–esque format. It was the kind of routine collision that happens thousands upon thousands of times at every level of the game across the country, from spring practice to summer hell week to autumn glory. And that scared me most of all. Footage of Lucas’s death does not exist on the Internet. NBC Sports, which held the AFL television rights, had its cameras elsewhere that Sunday afternoon, leaving the visual record of the game in the hands of a couple Fox Sports West cameramen shooting from the end zone. A friend of mine who works for HLN found additional video in the Turner digital vault, a contemporary report on the incident filed from the Fox affiliate in Lucas’s hometown of Macon, Georgia. When he showed me the tape, I steeled myself for an image as graphic as my nightmare. But it happens too quickly, lost in a sea of bodies, for me to realize that I am watching a man die. The Avengers were hosting the New York Dragons that Sunday afternoon. Lucas played special teams in addition to defensive line, so there he was after a first-quarter L.A. touchdown, hauling his 300 pounds downfield on kickoff coverage. Less than five minutes had run off the clock, and many fans were still finding their seats as the play unfolded. In the video, Dragons kick returner Corey Johnson heads up the left side, with teammate Mike Horacek directly in front of him, running interference. Lucas, wearing no. 76, ducks low to get past a blocker and collides with both Horacek and Johnson at about the 15-yard line, well clear of the Arena Football League’s sponsored dasher boards. Johnson’s knee and upper thigh smash into Lucas’s head at precisely the wrong angle. It certainly appears to be a harmless encounter. “I didn’t see or hear anything that was different than what I’ve seen a million times,” Avengers coach Ed Hodgkiss said at a press conference the next day. The Staples Center fell silent. L.A. team doctors ran out to attend to Lucas, not realizing he was taking his final breaths. The first clue this was worse than a regular injury was when team doctors removed Lucas’s facemask from his helmet. Neck and head injury protocol required the medical team to immobilize him, and that made the process easier. The macabre tableau probably looked familiar to many fans. Lucas was backboarded and hoisted onto a stretcher. Other players formed a prayer circle. A motorized cart came out to wheel Lucas to a waiting ambulance, which rushed him to nearby California Hospital Medical Center. The crowd gave Lucas an ovation as he was taken from the field. But there was no thumbs-up in response. The coroner’s office would later determine the cause of death as blunt force trauma to the spinal cord. It’s a disquieting diagnosis, since the entire sport essentially boils down to blunt force trauma — to the spine or the head or the knee or any other vulnerable body part. In this case, the cervical vertebrae that protected the parts of Lucas’s spinal cord adjacent to the skull were demolished, and the cord’s connection to the brain was fatally compromised. Technically, Lucas was still alive while sprawled on the field, but once Johnson’s leg struck Lucas’s head and neck, it was only a matter of time before he would die. It has become a cliché in these tragic accounts to proclaim the fallen athlete some sort of saint. Well, this story isn’t going to buck that trend, because everyone agrees that Al Lucas was a hell of a guy. They are running out of things to dedicate to him back in Macon. There is a scholarship fund in his name,2 and his old Little League field is now named after him. A few weeks ago, on a blustery March afternoon, the field house at Northeast High School, Lucas’s alma mater, was renamed in his memory. “It’s something we always talked about, being honored in this way,” says his brother, Lenny Lucas. Surely he didn’t mean posthumously. They called him Big Luke, a no-brainer nickname for a kid who wore size 15 shoes at age 13. He got to his adult height and weight, 6-foot-1 and 300 pounds, while he was still in high school, but it was a softer three bills, not yet hardened by a collegiate weight lifting regimen. Big Luke was a dominant defensive force at Troy State when the Trojans were still in Division 1-AA, just before they moved to the big leagues and began recruiting stars like DeMarcus Ware and Leodis McKelvin. Lucas was good enough to win the Buck Buchanan Award,3 given annually to the best 1-AA defensive player, as a senior in 1999. But when he went to the NFL combine, the Cincinnati Bengals team doctor found that Lucas’s left leg was incrementally shorter than the right, causing his legs to bow ever so slightly, and this convinced teams not to draft him. The Steelers brought Lucas in as a free agent. His father, David, told me that Al outplayed Pittsburgh third-round pick Kendrick Clancy throughout the preseason. “We drove out to see him play in Dallas,” David says, “and he was bustin’ those motherfuckers.” But Pittsburgh had invested money and organizational ego in Clancy, and that gave him an advantage that Al Lucas’s solid play couldn’t overcome. Carolina picked up Lucas when the Steelers cut him loose. 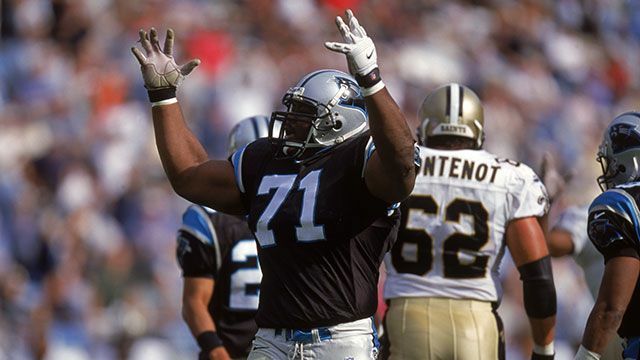 He was a rotation tackle for two seasons with the Panthers, recording more than 30 tackles, including a sack. He had his moments in the league, most of them violent. “I saw him bend Orlando Pace backward and mess up his knee,” says Al’s older half-brother, David Jr. “Al hit Ricky Williams so hard he drove him back five yards and gave him a concussion.” But after the 2001 season, he was cut again and went home to Macon. It was a tough time for Lucas — for the first time in his life someone had told him he wasn’t good enough at sports. His father convinced him to take up karate to increase his flexibility, and Lucas helped coach back at Northeast High. But there was a void. “He was sitting around the house moping,” David remembers. Then the Arena Football League called. The Tampa Bay Storm needed a lineman, and David pushed and prodded his son to accept their offer of $3,000 a game. “I think they gave him some more money under the table, to be honest with you,” David says with a certain pride. Whatever the inducements, Al joined the team with the season under way and transformed the Storm defense. In a league devoted to tumult, he brought order. Tampa Bay won the 2003 Arena Bowl and Al became a hot commodity. Los Angeles offered him a three-year deal to move west, which he did in 2004. “He absolutely loved the Arena League because of the close contact with fans,” says Al’s widow, De’Shonda Lucas. She started dating him after they took middle school Spanish together. She fell in love with his sense of humor — Al wore a lime-green suit to their junior prom. They were married in July 2004, just after Arena Bowl XVIII. By then, the couple already had a daughter, Mariah. She was just more than a year old when Al ran downfield to cover that kick at the Staples Center. After Al Lucas was removed from the field, the game continued. Everyone present realized Lucas had been severely hurt, but official word of his death wasn’t given to the players or coaches during halftime. AFL commissioner David Baker hadn’t planned on arriving at Staples Center until late in the third quarter that day. He was watching his son, then-USC star tackle (and current Atlanta Falcon) Sam Baker, practice at the L.A. Coliseum that afternoon. But Lucas’s severe injury forced him to leave early. He arrived at the game just before halftime, and with no official information at hand, Baker let the teams play the second half. But Baker told the media the day after Lucas’s death that the Avengers, from owner Casey Wasserman4 to Coach Hodgkiss to the players, said they had wanted to continue, and he was merely honoring that. With about five minutes left in the third quarter, Avengers team doctor Luga Podesta called with the news: Al had been pronounced dead at 1:28 p.m., Pacific Standard Time. The teams learned of Lucas’s fate in the locker room. The fans were left to discover what had happened on their own. Many suspected something was amiss when the postgame autograph session, a league staple, was canceled for the first time anyone could recall. “I went home and hugged my son,” Baker said at the time. David Lucas, who had just lost his son, was tracked down by a local TV crew in Macon. When asked for his reaction, Lucas broke down and wept uncontrollably. It was a blessing, perhaps, that none of the Lucas family saw Al lose his life. His father, then a member of Georgia’s House of Representatives, was politicking on the golf course, while back home, his mother, Elaine (a Macon city councilwoman), and Lenny couldn’t find the proper coordinates to pull the game in on satellite. Lenny had talked with his younger brother the night before. He had also played with the Avengers in 2004 — he was a linebacker, lining up just behind Al, as he had in high school and at Troy State — and they had lived together in California. “He was the dollar man, I was the low man on the totem pole,” Lenny explains. But after the team released him he drifted out of football and back to Macon. He was working as a bouncer in a local club on that last Saturday of Al’s life when his cell rang. It was his brother, checking in. Out in Dallas, David Jr. had run out for a soda and missed the last play of Al’s life. Nine years Al’s senior, David Jr., who won a Super Bowl ring with the Cowboys despite never cracking the active roster, was an inspiration more than a direct mentor. “I was 150 pounds,” he says, “and everyone said I was too small to make the league. I always told Al never to quit, and I had showed him I meant it. De’Shonda was driving home when the call came from L.A. “I kept saying, ‘He’ll be OK, I’m coming out to be with him,'” she recalls. “They had to repeat four or five times that he was gone.” The awful truth didn’t sink in until she got home and put the car in park. Then the tears and the shaking commenced. Estimates vary on how many folks turned up to pay their last respects. Anywhere from 600 to 1,900 attended Lucas’s funeral, held in the high school field house that would, eight years later, be named after him. Teammates from every level of ball were there, along with various politicians, religious figures, and Reverend Jesse Jackson, who is friends with David Lucas. One person who wasn’t there was Corey Johnson, whose leg was the blunt force that traumatized Al’s spinal cord. Johnson teaches and coaches football these days back home, which is also in Georgia, and anytime one of his players ducks his head to make a tackle, he cringes. “I get real fearful,” he says. Moving past a moment where he caused the death of a fellow player, no matter how accidental, hasn’t been easy for Johnson. No amount of Arena Football League–supplied counseling or locker room prayer could erase that moment from his mind. The words helped Johnson, but after his playing days ended he moved just 30 miles from Macon, 30 miles from the Lucas family’s pain, 30 miles from endlessly reliving that moment when he caused the local memorials to Big Luke. “It was an ongoing thing, and it was real tough,” Johnson says. “I thought about De’Shonda and their daughter. … It was a constant reminder … ” And here his voice trails off over the phone. Our conversation turns from what football did to Al Lucas to what it did to Corey Johnson, and I’m reminded that usually the sport kills slowly, not instantly. “I really question what football did to me,” he says. “I had plenty of concussions. We were taught to be tough. If you got your bell rung, you popped an Advil or two and went about your business.” These days, Johnson finds himself struggling to find simple words he knows he knows, or to remember elements of the lesson plan he has taught over and over. In some ways, 2005 feels like eons ago. ESPN’s Monday Night Countdown crew was still merrily screaming “He got … JACKED UP! !” while counting down the weekend’s biggest shots to the head. Alan Schwarz was still writing for Baseball America, his first concussion stories for the New York Times still two years away. Junior Seau was a year away from retiring — for the first time. And Roger Goodell was a year away from taking over as NFL commissioner. Instead, Lucas is largely forgotten, and our collective nightmare remains in the shadows. Since Lucas was killed, 29 players at all levels, mostly high school, have died playing football, according to research by the National Center for Catastrophic Sport Injury. All 29 were killed by direct football-related activity, such as tackling or blocking. Considerably more athletes have died from indirect causes, mainly heat stroke or heart attack. Al Lucas could have just as easily been killed on an NFL field. Inevitably, I believe it will happen to an NFL athlete. In all likelihood it will be a relatively unknown player — an undrafted free agent trying to impress on special teams in the preseason, perhaps. Regardless of the details, if it happens, the league won’t ever be the same. Indeed, the AFL was forced to cancel its 2009 season, although that likely was more due to the recession than to backlash over Lucas’s death. The AFL returned to action on a more limited scale in 2010. How would the NFL respond to such a tragedy? Further sops to safety, like eliminating kickoffs and preseason games? Or a combination of lawsuits and public outcry that fundamentally changes the NFL, its imperial status, and our devotion to it? Players who have been permanently injured while playing have granted us all absolution by cheerfully having their number retired (Dennis Byrd) or accepting an honorary roster spot (Eric LeGrand). But if and when the next Al Lucas perishes on an NFL gridiron, he won’t be around to offer us forgiveness. And I fear my nightmares will only worsen. Robert Weintraub (@robwein; www.robwein.com) is the author of the just-released The Victory Season: The End of World War II and the Birth of Baseball’s Golden Age and The House That Ruth Built. He has written for the New York Times, ESPN.com, Slate, CJR, the Guardian, and many others. Johnson would have knee surgery not long afterward, an injury he feels can be traced to that collision. To donate or apply for the scholarship, go here. Wasserman, the grandson of legendary Hollywood macher Lew Wasserman, is also a powerful sports agent and entertainment mogul. He was only 24 when he bought the Avengers, making him the youngest person to own a pro sports franchise in American history. Baker has not given many interviews in the last few years, and he chose not to answer interview requests for this piece.